I am joining the Really Reasonable Ribbon DT Members for the August Blog Hop. If you are ready for fall or love to add the rich fall colors into your creations, you are going to love the Monthly Ribbon Club Assortment this month! I used the beautiful orange ribbon and crocheted lace in the Monthly Ribbon Club Assortment. Then I added a bow with the Ivory Burlap String. I then added the Earth Tone Chrysanthemums , tucked in Mulberry Leaves and vintage buttons. I am so ready for autumn with it's cooler weather, pumpkin spice, flannel shirts and leaves crunching under foot. Would you like more creative inspiration? Check at the other fabulous DT Members projects on the Really Reasonable Ribbon Blog. 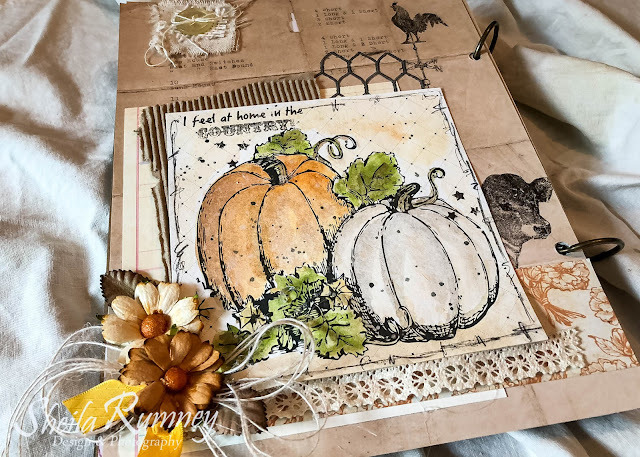 What a gorgeous fall journal page. Love it!! I love the vintagey country feel of this beautiful project! Gorgeous page! I love this beautiful Autumn Assortment! Such pretty colors! Oh Sheila - I am enjoying your Journal page creation- I love the embellishments you used as well as that beautiful layout - everything is outstanding here!! The ribbon --- well what can I say? I would love to win that! 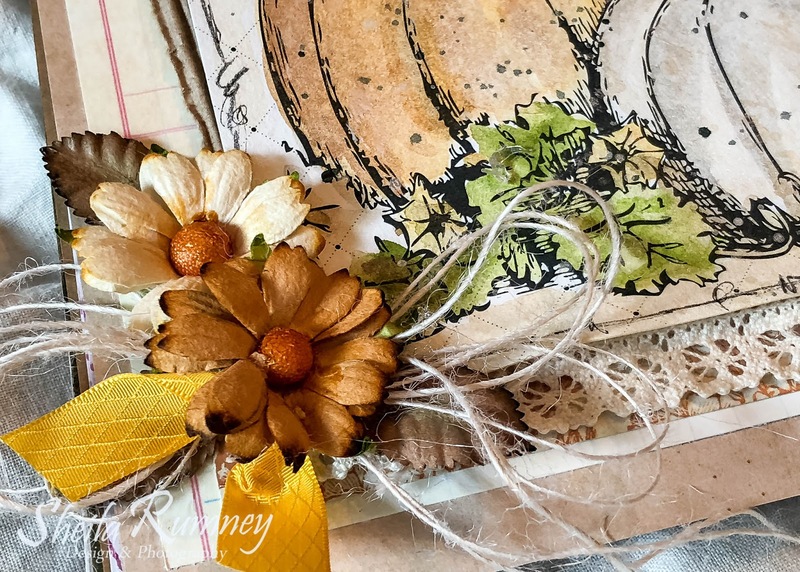 Oh my goodness such a great find and I like how you add ribbon to your journal page as well - [Fall is my favorite season but honestly I am not ready yet - cuz here in Michigan I know WINTER is coming] Just saying --- but I do like the colors! Have a blessed day - TFS your art! 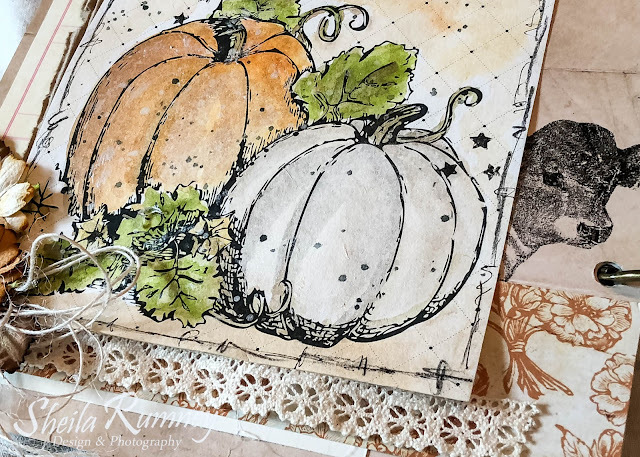 This project is really catching my attention...beautiful colors of Fall! I'm going to pick up some of that light twine...very nice addition to this project. Well done! This is lovely, Sheila. Love the harvest feel. I'd love to have you stop by and link up your project in our challenge this week - we have awesome prizes, and I'd love to have you join us. www.wordartwednesday.blogspot.com - my challenge blog - I hope you will play along. I like your use of mixed media and the country life feel of this layout. You did great! Love this journal page! It softly whispers Fall. The colors, layers, flowers and ribbons all perfectly placed. Well done tfs. Love, Love, Love the journal page. The pumpkin stamped image is such a wonderful image..would you mind sharing what stamp is it? I feel like I have seen it somewhere, but just can't quite get it right...again, what a lovely page - serene and countrified (is that a word? - ha)I just love it! This is sooo sweet! The little calf peeking out from behind melted my heart. (Yes, I am a country girl through and through. lol) All the pretty touches and details are perfect. This is so pretty. Fall is my favorite time of year. I love the vintage goodness that you packed into this project! Just stunning!! !